The orthopedic staff therapists at Furnace Brook PT have seen an annual increase in the number of total shoulder replacement surgeries over the past 7 years. More people, who are also younger than what had been seen just several years ago, are electing to have their shoulder joint, or glenohumeral joint, replaced due to debilitating pain, grave loss of motion, and limited function. Though the modern Total Shoulder arthroplasty (TSA) and the Reverse Total Shoulder arthroplasty (rTSA) can now claim to improve both pain and function, orthopedic surgeons and their patients owe a great deal to Dr. Charles Neer for his pioneering work in the development of shoulder arthroplasty in the mid 1950’s. Today’s era of shoulder replacement technology and surgical precision has given rise to dramatic improvements in patient outcome. Furnace Brook PT owner, Jay Bernasconi, can remember just 10 years ago being told by a surgeon that a patient would be lucky to achieve an active elevation of 110-120 degrees; just being slightly higher than the nose to eye level and that the primary goal was pain relief. Today, he has been instructed to gain 160 degrees-170 degrees, and while the primary goal remains pain relief, a greater return of function is expected. Though every surgical case presents differently, this is a major philosophy shift forward. The degree in which a patient presents with an intact rotator cuff plays a large role in deciding if the surgeon elects to perform a Total Shoulder Replacement, or a reverse Total Shoulder Replacement. This is due to the stability and existing musculature that the prosthesis needs in order to restore an acceptable margin of mobility and satisfy the patient. There are caveats to the rehab of each procedure, but of paramount importance to the Furnace Brook PT staff is that the surgeon is pleased with positioning, that the safety of the prosthesis is the primary goal, and that the surrounding tissues are allowed to heal and mend with a functional length. When accomplished, and the postoperative time passes, the patient will have a supple but stable shoulder. 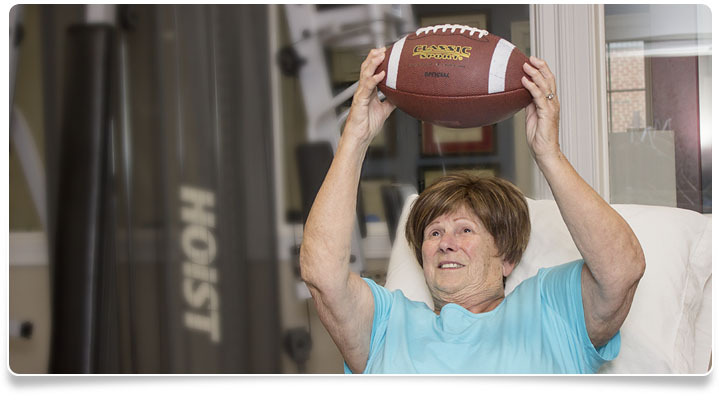 If you’ve had shoulder replacement surgery and are in need of rehabilitative physical therapy, you can trust Furnace Brook PT. Contact us today for an appointment at 617-770-4167. We serve Quincy, Massachusetts and surrounding areas.